How many wise men are there in this narrative? What sort of a building did they find Jesus in? Is Jesus still a baby in this narrative? The Magi had been told by Herod to report back to him what they had discovered in Bethlehem, so that he too could ‘go and worship him’ (2:8). But God knew Herod had absolutely no intention of worshipping Jesus. God saw Herod’s wicked heart. So, having given their gifts to the Christ-child, the wise men were told in a dream to go home another way. 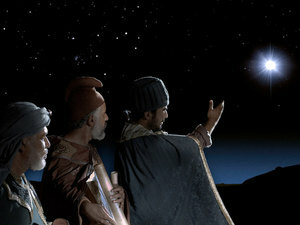 The glow of Christmas quickly faded when Herod learned of the Magi outsmarting him. He declared that all little boys from the Bethlehem area, aged two and under, must be killed. But God intervened, telling Joseph to escape with his little family to Egypt. After Herod’s death, an angel again came to Joseph in a dream: ‘Get up, take the child and his mother and go to the land of Israel, for those who were trying to take the child’s life are dead’ (v 20). There will always be ‘Herods’; people who are jealous of our faith, and the serenity and peace Christ brings to our hearts. They might even threaten persecution. Or they could prove to be deceitful in their intentions. They no doubt will mock, belittle, even laugh at our commitment to Christ. We must turn to God for strength, for guidance – committing ourselves to him once again. And God always provides an ‘Egypt’ for us during difficult times. A place of refuge; a safe place where we know God is forever present with us. For he is our Deliverer, and with him we know that, somehow, all will be well. Today, let us take time to simply worship Christ – telling him once again how much we adore him, love him, long for him. Let’s thank him for always being with us, and for his promise to remain with us – always – until we see him face to face.